Dads, we do count! So lets start hammering the message home!! For those of you that have missed it Steph and I are expecting our third child sometime around the end of July beginning of August. If previous form is anything to go by August is more likely. Anyway this has lead me to some serious thinking, hence this post. 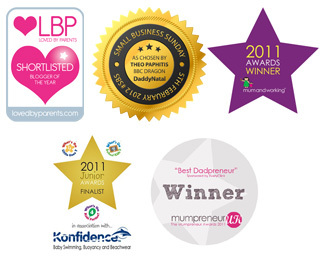 Wow what a few weeks, first up we won Best Dadpreneur at the Mumpreneur UK 2011 awards, then we were awarded Business Parent of the Year at Mum and Working awards and now this!! Dads, this is something you really should be thinking about! ﻿﻿Babywearing is great for us dads, especially in that that we can calm our babies excellently using the closeness of a baby carrier. The bass vibrations of our voice can have great calming affect on baby. One of the things I never tired of when carrying our children was just tilting my head and being able to gently kiss the top of their head. I also previously mentioned postnatal depression and the causes, one of these being not feeling bonded with baby… well babywearing is a great way to bond with your baby. I think for mum and dad, one of the great things about babywearing, is being able to do so many things whilst sharing the experience of what you are doing at same time. For baby, too commonly their view of the world for first 9 months or so, is the sky, from laying in their pram as we shop, walk or generally get about. Through babywearing, they get to see everything we see, which obviously has to support their development. I used to find myself pointing things out and talking about them whilst carrying the kids, but in retrospect, I realise that when I was pushing them in a pram, we didn’t really engage with them! Relatively simple to use. It’s also a favorite amongst mums who like the ease and privacy it provides for breastfeeding. Although they are quite versatile and can be adjusted to a hip carry for older kids, not the type I ever got on with and one I rarely see men using. The other drawback is they tend to be size dependant for wearer, so not great for couple who want to use same carrier. At the end we review the SnugBaby take on this type. They are also known as an Asian Baby Carrier (or ABC). Basically a rectangle piece of fabric with four straps, two for the shoulders and two for around the waist. The straps are criss crossed and tied for security. Mei tai carriers, tend to distribute the weight more evenly than most and can be used in almost all carrying styles. Most are not recommended for newborns (unless its a SnugBaby) but can be used right into toddlerhood. Probably too quickly dismissed by many, I know I certainly did as a new dad, but wouldn’t anymore. These are basically just a large piece of fabric. They can be used in huge array of different styles, but the drawback is the wearer has to learn how to safely tie each style! For this reason I am not keen from male perspective, although I can see that if you are using them daily you will quickly remember the different ways to tie them. However, I feel for dads, who maybe are only getting opportunity to babywear at the weekends, just too much time and stress re learning how to tie it each time! Probably the most common sort that you will see dad carrying baby in. Personally, I think this is only because the manufacturers of theses types recognised huge male market and addressed it. The other types of carriers have very minimal promotion of use by dads. I am also reviewing the Baby Bjorn active carrier, one that I also used with my children. These are pretty restricted in carrying styles, but easy to use and quite masculine in appearance. This was carrier we bought for our son and then used also with our daughter. This really became my carrier, not sure if this was because Steph wasn’t keen on it or because setting it up is like getting your seat position right in the car, only for someone else to drive it and change all the settings! So if she did use it and naturally would have to change the set up, she wouldn’t hear last of it from me! Come on guys, you know what I mean, right? Overall this is a simple to use, functional, mid budget carrier. It is comfortable to wear and easy on the back. When you first receive the carrier, it is in two parts, I know we hate instructions, but use them! I did the typical male thing, ignored the instructions, spent 30 mins trying to figure it out… only to then read the instructions and have it ready to go 5 minutes later! Once you have got it together, you will spend some time setting the carrier up to suit yourself. This is probably the main drawback to the Baby Bjorn, if you are going to share the carrier you will be forever re adjusting it to suit each other. It is also claimed to be breastfeeding friendly which I would dispute. I know a few women that have tried and it is certainly not easy or discreet to achieve. OK, wow, what a convert I became, once I got the hang of it, I loved it. The basic ties are a doddle, and even the back carry takes no time at all to get a grips of. I really thought my two kids would challenge the SnugBaby claim that it is suitable even for toddlers… especially with them being 23 months and even 35 months!! Not at all, had my little girl up and carried within minutes and she loved it! My concern over back support was unfounded, I found the carrier comfortable and supportive, the wide straps where they cross the back ensure maximum support and spreading of the child’s weight. The carrier itself is so lightweight, and add to that the multiple different positions you can use it in, I really think this is superb! Also, there is no problem in any number of people using the carrier, as there are no settings to remember… put it on, tie it up and away you go… it really is that simple. Honestly guys, take long hard look at this one, don’t dismiss it because of the female-orientated website or the colour schemes. The product itself gets a resounding FIVE star review the website and marketing approach unfortunately only get a THREE star review and again thats boosted by the product. To be clear these reviews are from a dads perspective, I am not a babywearing expert and I am aware the different opinions exist regarding different carriers types. I am hopeful we will have full guest blog on baby wearing from expert shortly.